Sauteed Scallops with Parsley and Garlic | Om nom nom! Sprinkle scallops with salt and pepper. Heat spray in a large nonstick skillet over medium-high heat. 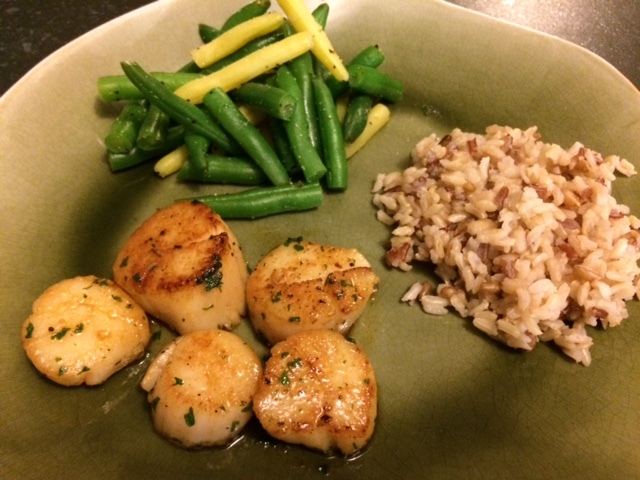 Add 8 scallops; sauté 2 1/2 minutes on each side or until browned. Set aside, and keep warm. Repeat procedure with remaining scallops. Wipe pan clean with a paper towel. Add smart balance to pan if using; reduce heat, and cook until it melts. Stir in parsley and garlic, and cook 15 seconds. Return scallops to pan; toss to coat.